When a child is in the infancy stage, every parent is concerned that the child has as healthy a transition into their early days as possible, and as few problems to face as well. Children need very healthy teeth to chew their food, have clear and sound speaking, and to possess a winning smile. When children’s first teeth come in correctly, it is the base of stepping stone that guarantees their adult teeth to come in correctly as well. Milk, formula, fruit juice, and sodas have the capability to pool around the infant’s teeth and gums, which feeds the bacteria ultimately causing plaque. The sweet fluids that are left in the mouth after sucking on pacifiers that are dipped in honey or syrup are also associated with this common decay. Many parents of newborns don’t mean any harm by leaving their infant under these circumstances, and are just trying to find ways to get them to be content and calm. 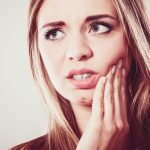 This occurs most often in the upper front teeth, but others are not immune. Research has shown that drinks that contain sugar are among the most common causes. It has long been a tradition to put babies to bed with a bottle, or use a bottle as a pacifier. Tooth decay begins with cavity-causing bacteria that is passed from the mother to the infant. The bacteria is usually passed through saliva, and can also occur when the mother puts the baby’s feeding spoon directly in her mouth, or cleans a pacifier using her mouth. Even though the stats are debated by many, some say that if an infant or toddler does not receive an adequate amount of fluoride, they are prone to this form of tooth decay. Why should parents be worried about baby bottle tooth decay? There are a lot of parents out there who think that giving an infant a sugary drink at bed time is alright for them. The first thing that happens when you do this is that the flow of saliva decreases drastically, allowing the sugary liquids to stick around on teeth for a long time. If it is left untreated for long enough, it can cause pain and serious infection. When teeth become seriously decayed, they may need to be extracted. Other problems that stem from this are poor eating habits, speech development issues, teeth that may be crooked, and adult teeth with damage. If your toddler or infant does not receive enough fluoride, they may also have an increased risk for this type of tooth decay. What are some steps that prevent this type of decay? 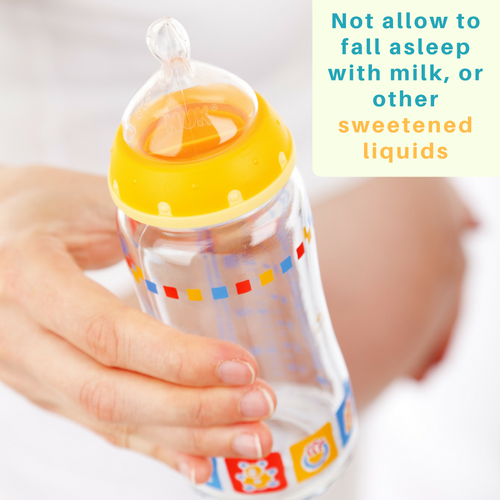 Not allowing a child to fall asleep when their bottle contains milk, formula, juice, or other sweetened liquids is one of the best first steps in prevention. Look at your baby’s gums and massage them, to help aid in teething and establishing very healthy teeth in the long run. After every feeding, you can wrap a moistened gauze square around the finger, and gently massage the gums and tissues in the area. After a baby shows their very first tooth, this is the time when plaque removal activities should take place. If you brush your child’s teeth, use the softest toothbrush available, and water. What many dentists recommend is asking their opinion about using toothpaste before the child’s second birthday. 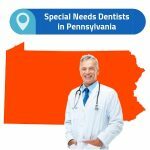 Take the child to the dentist when they are between 6 and 12 months old to get a professional opinion on where they are at. Are there some changes in diet that can help? 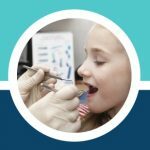 When dealing with baby bottle tooth decay, there are some changes that can gradually be made to help. 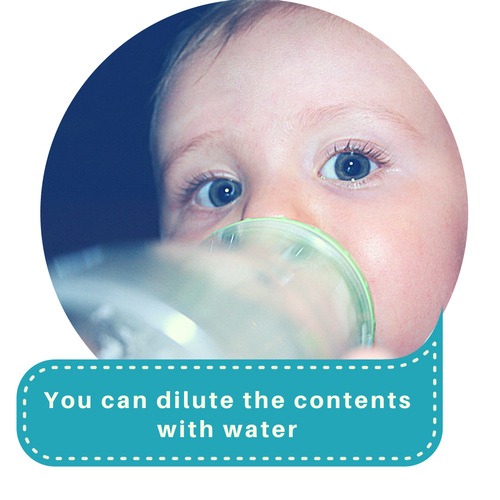 If you are feeding with a bottle, you can dilute the contents with water, and slowly make this change over a period of two or three weeks. After that period is over, you can begin to just give the child water, which is the only liquid that will prevent baby bottle tooth decay. Decreasing sugar intake is one of the most important things you can do for this condition: also weaning a child from the bottle as soon as they can drink from a cup will help greatly. 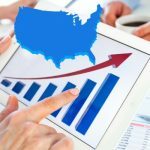 This may not necessarily be as serious as cavities or periodontal disease that can develop much later in life, but needs close attention paid to it. In years past, many parents used whatever it took to pacify their baby: even whiskey. With the knowledge available to many now, it is important to take drastic measures to prevent issues such as baby bottle tooth decay.